Following the 15th anniversary of it-economics, we move to a new, larger office in Munich near the Leuchtenbergring, in the second quarter of 2018. This way, we take account of the continuing growth of employees and we create new spaces for creative, common work. An exciting project is progressing. Starting with three IT consultants (the founders), in Munich in 2003, it-economics has opened 7 offices in Germany and two foreign branches in Bulgaria and Switzerland. The number of employees has risen to now 150, and thanks to new projects, many new colleagues will join the it-economics family. The current Munich office in the middle of Haidhausen impresses with its charm and the central location at Rosenheimer Platz, but the premise reached its limits. When, if not now, in the year of it-economics' 15th anniversary, would be a better time, to move to a new and modern headquarter? 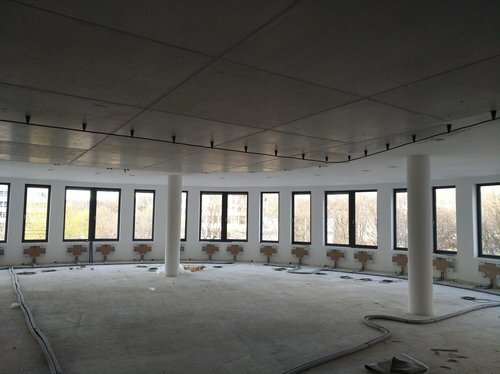 More than twice the area of the old office will soon be available to it-economics in the new office at the Leuchtenbergring. It should facilitate optimal work conditions and space efficiency for a modern work ambience. Planned is a mixture of open space, meeting area and retreat possibilities. Meeting rooms, telephone cubes, workstations for standing or sitting, a small event arena, color accents and plenty of light thanks to large window fronts create a space for creativity and flexibility. Now that the planning and concept for the new office has been jointly agreed upon and the construction is completed, we can notice changes and follow the progress almost weekly. The project remains exciting in the coming months when the interior design and decorations will gradually give the office area new shape and look.